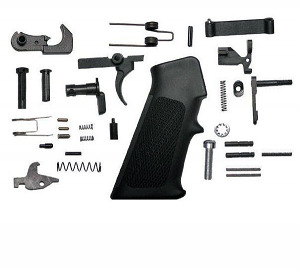 DPMS Panther Arms AR-15 Lower Receiver Parts Kit includes: Pistol Grip, Trigger, Hammer, Disconnector, Selector, Bolt Catch Spring, Detent Spring, Bolt Catch Buffer, Take Down Detent, Bolt Catch, Magazine Catch Spring, Bolt Catch Roll Pin, Magazine Catch Button, Magazine Catch, Front, Pivot Pin, Hammer Spring, Trigger Spring, Pistol Grip Screw, Pistol Grip Lock Washer, Selector Spring, Detent Selector, Hammer Pin, Trigger Pin, Take Down Pin, Buffer Retainer Pin, Buffer Retainer Spring and Disconnector Spring. All parts accounted for and easy to instal. Top quality materials with no trigger creap. Very happy with this package. Top Gun shipped this order out almost before I was done placing the order. Thanks for your high quality parts and Service Top Gun.